From celebrity-inspired looks to a range of new color technology and more, you likely have more clientsrequesting a vibrant whole-head look or just some fun party pieces. But it’s important to remember when doingso, it must be done carefully and correctly. Unicorn hair, ombre, color contouring, blonding—clients request these services and others every day, whether the look is right for them or not. As a professional, it’s your job to take your client’s request and create fl attering color without damaging her hair. Depending on the service, this can be time-consuming and expensive for the guest. We asked five colorists to weigh in on five different color services with tips and advice on how to keep their clients’ hair healthy while delivering beautiful, wearable shades. Over the past few years, vibrant color has jumped from the pages of Instagram and gone more mainstream. From celebrity-inspired looks to a range of new color technology and more, you likely have more clients requesting a vibrant whole-head look or just some fun party pieces. But it’s important to remember when doing so, it must be done carefully and correctly. Before applying all the shades of the rainbow, hair must be lightened. Renee Valerie, TIGI U.S. technical education director uses TIGI Copyright Colour True Light White because it has chamomile, sugar crystals and amino acids to help maintain the integrity of hair while lightening. But first, she says colorists must carry out texture, porosity and elasticity tests to make sure hair can handle the lightening process. If the client has virgin hair the process will be more predictable. With such a major change, she also recommends a thorough consultation. “In the consultation, you should be able to determine the client’s personality/comfort zone and what will flatter their complexion and skin tone the most,” she says. Matt Swinney, the NAHA 2017 Haircolor of the Year award winner and owner of Evolution in Minneapolis, says his go-to for vibrant shades is L’anza’s Vibes. More often than not, his clients who crave a little color are after just a splash rather than the whole head. And that can be for anyone—not just 20-somethings. “The nice thing about older women who want something different is I’m able to give them just a splash of turquoise in gray/silver hair,” he says. AT-HOME MAINTENANCE: Swinney recommends a color-care shampoo and conditioner, but more importantly, he says clients should only be washing once a week to keep the shades vibrant. APPOINTMENTS NEEDED TO ACHIEVE DESIRED RESULT: It depends on the client’s existing level and the chemical history of the hair. TIPS ON PRICING: Start with a base price based on your time, skill and area you live. From there, have an hourly rate or percentage you add on. Valerie agrees clients will need to come in often to maintain vibrant shades. Making a brunette blonde can be one of the most damaging processes for a client’s hair. It can also be one of the trickiest. Different levels lift to various shades, including orange. But an experienced colorist knows how to safely lift the darkest hair to the creamiest blonde without permanently damaging strands or ending up with brassy color. “Making a brunette like J.Lo blonde is no longer done with a single-process bleach,” says Beth Minardi, educator and color director at Samuel Shriqui Salon in Manhattan. Minardi, who also has her own color and color-care line, Beth Minardi Signature, says she made one shade especially to take level-2 hair to a lightest-brown ash. 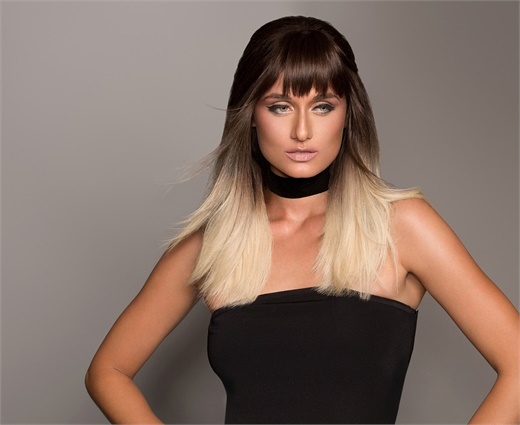 From there, Minardi mixes a powder lightener with 20-volume developer into a sour-cream consistency and sections hair, working from the nape to the top of the head using long foils to bleach the hair shaft. The client might need more highlighting around the face ora glaze to finish the look. To keep the look perfect, Minardi says the client must come in every three to four weeks for a new growth touchup and every eight to 10 weeks for highlights. “It’s arduous, time-consuming, labor-intensive—and an art,” she says. But be warned—once you start lightening hair that has been colored dark, it can experience breakage. Minardi says some clients require many appointments to safely achieve the shade of blonde they desire. Beth Busbee, colorist and owner of Beth Busbee Hair in Venice, California, also advocates for careful highlighting to make a client blonde and keep hair healthy. After a thorough consultation, Busbee says determining the shade of blonde depends on the health and condition of the client’s hair. She often uses highlights to blend a guest’s gray and to achieve the perfect shade of blonde. For toning, Busbee turns to a slightly ash shade to cancel out any unwanted warmth. Before and after lightening by Matt Swinney. APPOINTMENTS NEEDED TO ACHIEVE DESIRED RESULT: It depends on the client’s hair—how dark is it? Has it been previously colored? What shade of blonde does she want to achieve? Some clients can achieve blonde in one appointment; others might need many appointments spread over several months. TIPS ON PRICING: Minardi recommends doubling the price of the most expensive color service on your menu. FREQUENCY OF VISITS TO MAINTAIN THIS LOOK: Every three to four weeks for new growth and every eight to 10 weeks for highlights. For some clients, the best way to get the color they crave, whether it’s neon pink or golden blonde, is with extensions. Clients with fragile, thin hair are great candidates for extensions as well as those who want a pop of color without the commitment. 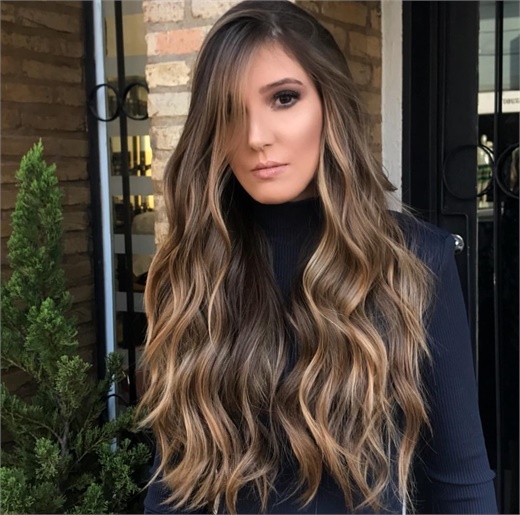 Victoria Casciola, artistic director for International Designs Corporation (makers of Hairtalk extensions) and senior stylist at Hotbox Salon + Spa in Las Vegas, says you can do just about anything with extensions. Hairtalk is also launching 60A, a blonde-ash extension, to give clients the shade they most desire—blonde without warm undertones. And for clients who want to achieve an ombre look via extensions, the Colormelts collection allows them to do just that. Color effects using Hairtalk Extensions. AT-HOME MAINTENANCE: Hairtalk’s Essential Hair Care is specifically designed for extensions with select nutrients to keep extensions healthy. Avoid regular shampoos, which might contain ingredients that can weaken the adhesives used to attach extensions. APPOINTMENTS NEEDED TO ACHIEVE DESIRED RESULT: The initial service can be done in less than an hour for a full head of extensions. TIPS ON PRICING: “It’s a luxury service, so it should be priced as a package (the service and price of extensions should not be presented to the client as one price),” Casciola says. “If they want length, it’s a $1,200 service. For fullness, it will be about $800. For Pops of Color, $250.” The cost of extensions depends on length and color, but they run $150-200 per pack, and a stylist uses an average of three packs on a client. FREQUENCY OF VISITS TO MAINTAIN THIS LOOK: Every eight to 10 weeks. Clients with finer hair might have to come in more often. Savvy color clients have figured out that makeup isn’t the only way to contour facial features. Lightening around the hairline flatters many faces, and some salons are now offering contouring on their color menus. Minardi says when you are doing a color contour service, you should note the finer hair around the client’s face. “This hair is estrogen influenced and baby-fine,” she says. “It tends to grab darker and drabber.” She says you should also ask the client if she often wears her hair in a ponytail or directly off her face. Color contour by Truss Professional artist Mario Henrique. Minardi says most of the contouring she does around the face is achieved by glazing with softer, lighter tones with lighteners and acidic glazes. Casciola says her favorite way to brighten up clients who want to make their features pop is with 9+ BlondMe powder bleach from Schwarzkopf Professional. Although she does balayage some clients, she believes the babylights she places around the face are more consistent in foil. Valerie says she likes to use TIGI Copyright Colour Gloss as her base shade and either Lift or True Light White to lighten her contour clients. In the consultation, Valerie also determines what shades will be most flattering to skin tone, complexion and eye color to bring out the guest’s best features. And if hair is not in good condition, she recommends the client use a hydrating mask and consider a hair cut to ensure the hair is as healthy as possible. During her client consultations, Casciola is always open to pictures. AT-HOME MAINTENANCE: Moisture-based shampoos and conditioners like Catwalk by TIGI Fashionista, that also help control unwanted brassiness between appointments are a must. Minardi sends her color clients home with her pre-wash therapy to use twice a month to maintain hair health. Casciola recommends Davines Nounou shampoo and conditioner to her clients for at-home care in addition to a color masque. TIPS ON PRICING: Have a starting price for creative color services and add depending on time. It also depends on where you live and what the market dictates. But you must charge for your time and skill appropriately. FREQUENCY OF VISITS TO MAINTAIN THIS LOOK: Contour clients generally have to come in for maintenance every five to six weeks, Valerie says. Minardi uses a lightener and a demi-cream color for low lighting and finishes with a liquid acidic demi for glazing. She also recommends using long artistic foil and long butterfly clips to avoid folding hair. But first, hair must be healthy. “Once a steak is well-done, you can’t make it medium-rare,” she says. “The best thing to do with hair that is damaged is cut it off. Then softly re-highlight pieces that have not been damaged and glaze hair. After, you must deeply condition at the salon and at home. Thick, denser hair is a lot stronger and might withstand more, but lightener will work faster on thinner hair, which is why it’s key to watch foils, checking every 10 minutes. Swinney says he often utilizes the mistake when trying to soften a harsh line from a bad ombre. Minardi takes a grown-out, over-processed ombre to a beautiful copper balayage. After lightening and applying color, he glazes, usually down a level or two. Application can be tedious, and it often takes multiple appointments to fix hair this damaged, Swinney says. After the service, Swinney finishes with L’anza Keratin Healing Oil Emergency Service, a 10-minute service to keep hair healthy and shiny. “It’s kind of like putting scaffolding in the bonds of hair to rebuild and give strength again,” he says. strengthening shampoo. I also send them home with a small bottle of leave-in conditioner to use on mid-shaft to ends the first two weeks and a healing oil to protect from heat styling. FREQUENCY OF VISITS TO MAINTAIN THIS LOOK: When an ombre is done well, it grows out beautifully. Clients should only have to come in every eight to 10 weeks— possibly even 12 weeks. If it’s done correctly, maintenance more often than that is not necessary.